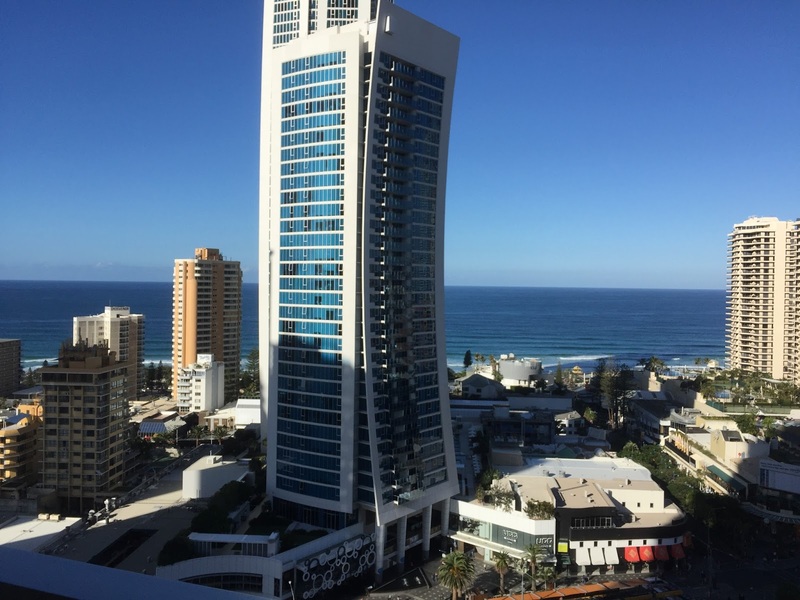 Mantra Circle on Cavil is located at the heart of Gold Coast in Surfers Paradise. 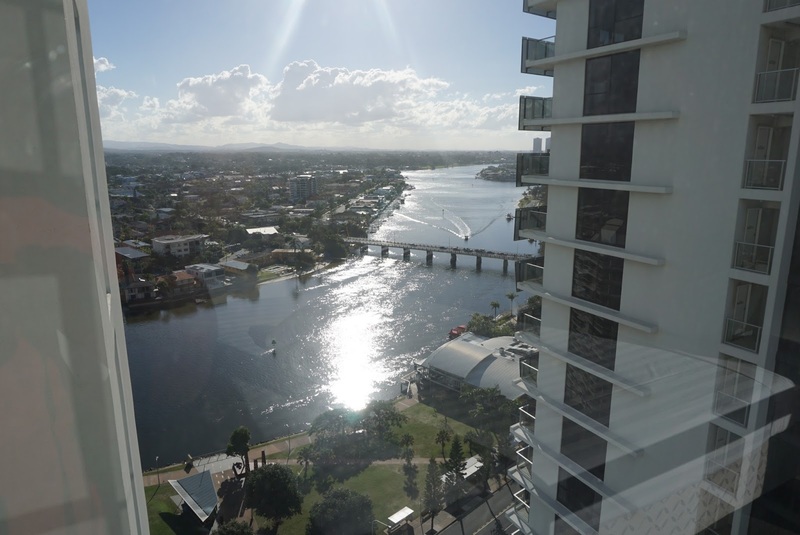 The apartment is about 1 hour drive away from Brisbane International Airport and is in close proximity to most of the attractions around Gold Coast. 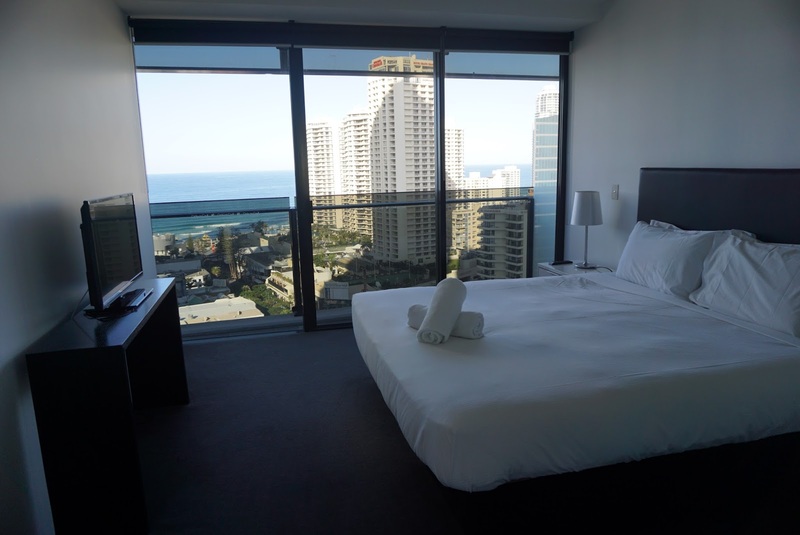 The apartment is also within 2 mins walk to Cavil Ave Mall, where visitors and locals end up most of the time and within 5 mins walk from the beach. The apartment over looks the beach out front and the river behind. 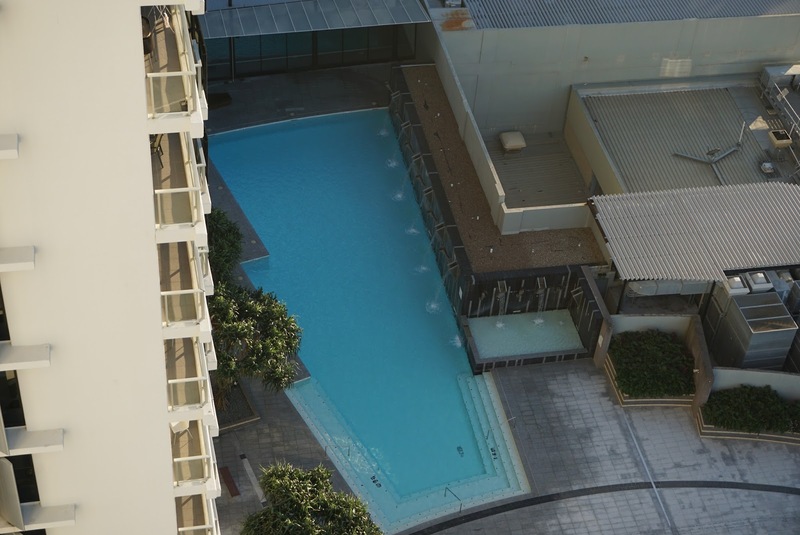 There are no lack of amenities like supermarkets around the apartment, in fact there is one right below the apartment and a couple more within 2 mins walk from the apartment. Entering the massive 117m² 2 bedroom apartment, through a small corridor, the apartment opens up to a spacious living room. 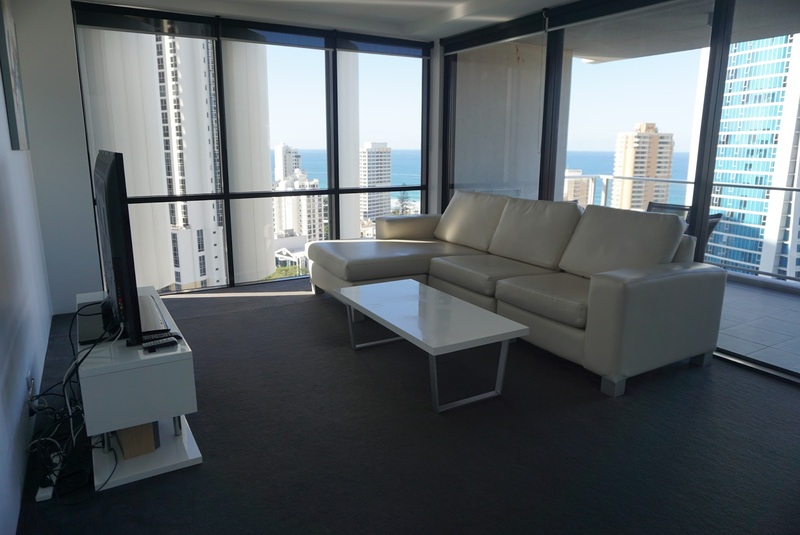 The living room is simply decorated with a 4 seater L-shape couch placed in front of the glass door to the balcony. A coffee table and a 46″ LED TV is also placed in the living room, which are functional. The minimalist decor of the living provided abundance of space for its occupants. 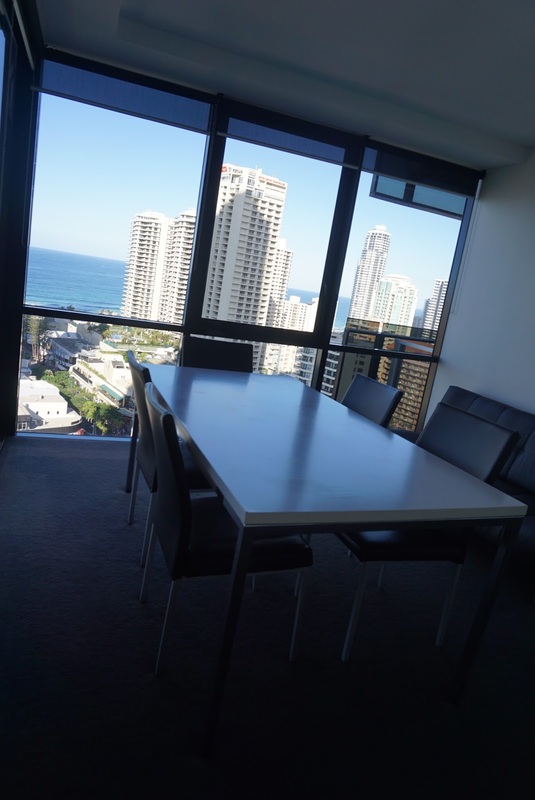 A section of the glass door opens up to the spacious balcony that overlooks Surfer Paradise beach and Cavil Ave. There is a small table with 4 chairs placed in the balcony for its occupants to rest and soak in the magnificent view, which serves as a great spot to watch sunrise over the South Pacific Ocean from. To the right of the entrance, facing the living room is where the open kitchen is located. Separated by a kitchen island counter from the living room is where a dual kitchen sinks are located. Full sets of cutlery for up to 6 pax and kitchen wares can be found stowed neatly in the drawers of the kitchen island counter. 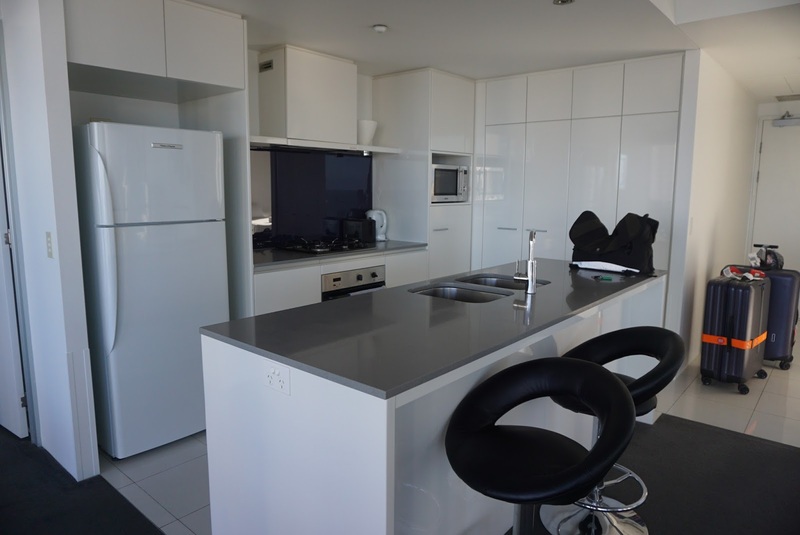 The apartment is furnished with a fully functional kitchen, equipped with stove, microwave and a full fridge. Bowls, plates, cups and mugs of all sizes can be found in the cabinets built onto the walls of the kitchen. Further into the apartment, past the kitchen and before the entrance to the master bedroom is where the dinning room is located. The dinning space is furnished with a 6 seater table facing the beach and the ocean. There is a sofa bed, capable of sleeping 2 adults when converted into a bed, is placed by the wall facing the dinning table. Entering the master bedroom, the king bed immediately catches my attention. The king bed is very comfortable and provided me with great sleep quality. There are a couple of bedside tables with 2 drawers on either side of the king bed, providing additional storage space in the room. In front of the king bed, placed onto a TV console is a 32″ LED TV. The space in the master bedroom is sufficient for one to walk around and perhaps stow one large luggage opened on the floor. 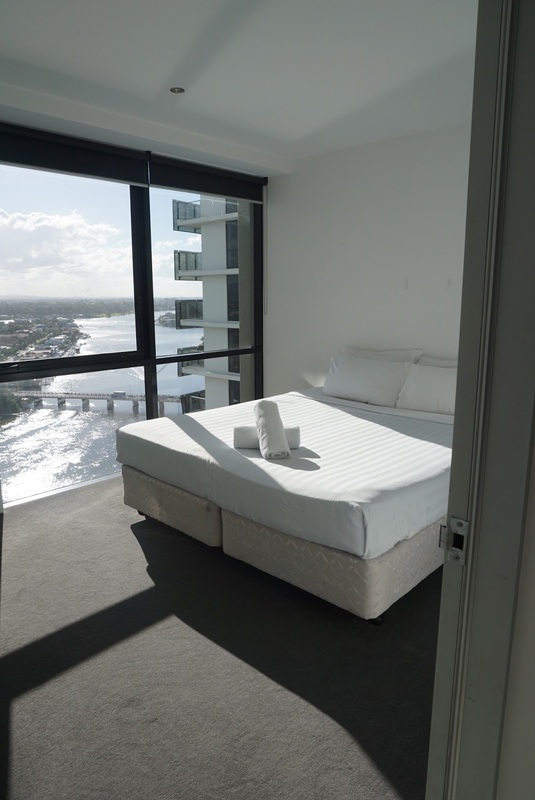 There is a small balcony in the master bedroom. Further into the master bedroom, one can find a 3-panel wardrobe, providing huge storage space for its occupants to put away months of clothing. A couple of vacuum cleaners are hidden in this wardrobe. There is also a 3-tiered shelf tucked into the wardrobe. There is an ensuite bathroom in the master bedroom. 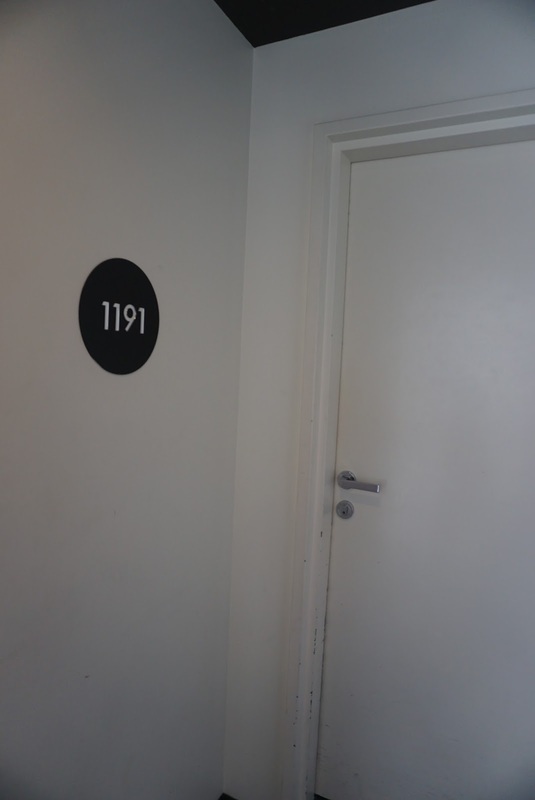 Right next to the main entrance to the apartment is where the second, smaller bedroom is located. This bathroom has a much more simpler decor than the master bedroom. The second bedroom has a queen size bed in it, completed with a couple of bedside tables on either side of the bed. This bedroom as a 2-panel wardrobe that has sufficient space for one to stow up to 2 weeks of clothing. As this bedroom is smaller, there are not much space in the bedroom to stow an open luggage. There are no TVs in this bedroom. There are 2 bathrooms in this apartment. One is located inside the master bedroom, while the other one is located outside the second bedroom. The bathroom in the master bedroom is rather spacious. 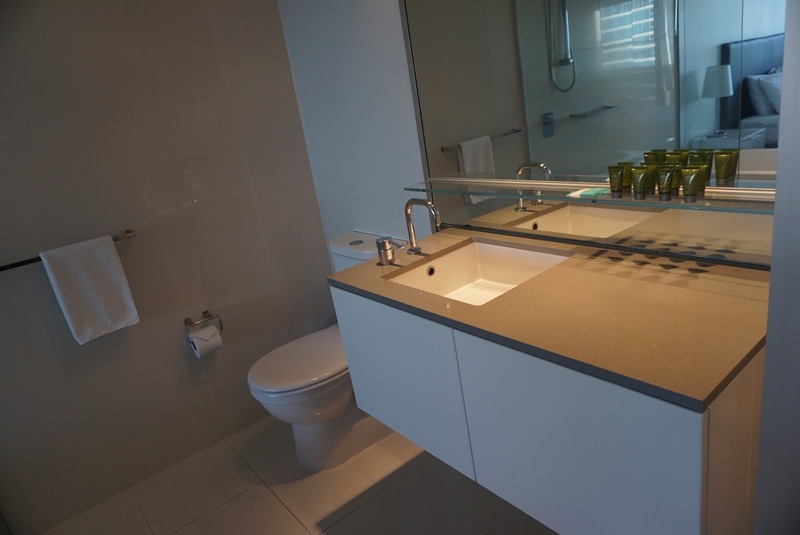 Entering this bathroom, the single sink countertop is located to the right of the entrance. Although compact, there are sufficient space for one to stow their additional toiletries. A toilet bowl is tucked in the corner of the bathroom, after the sink. The wet area of the bathroom is separated by a glass panel. 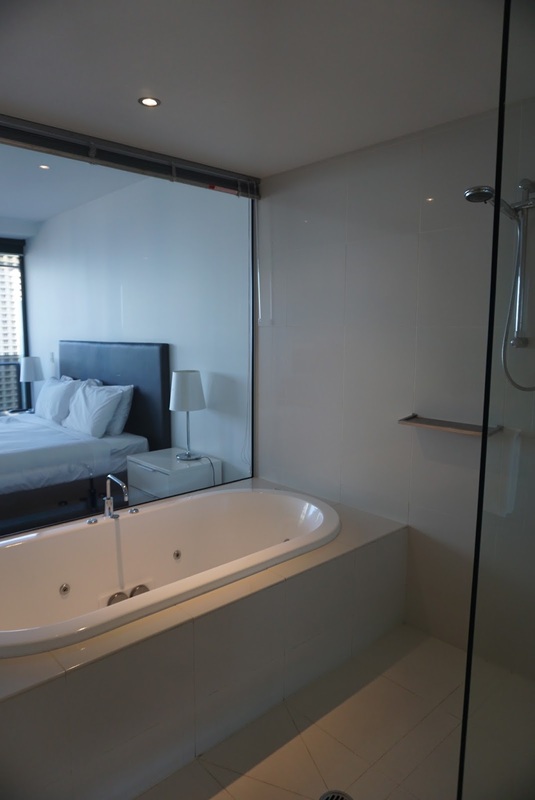 In the wet area, there is a huge Jacuzzi bathtub tucked at the side of the bathroom. 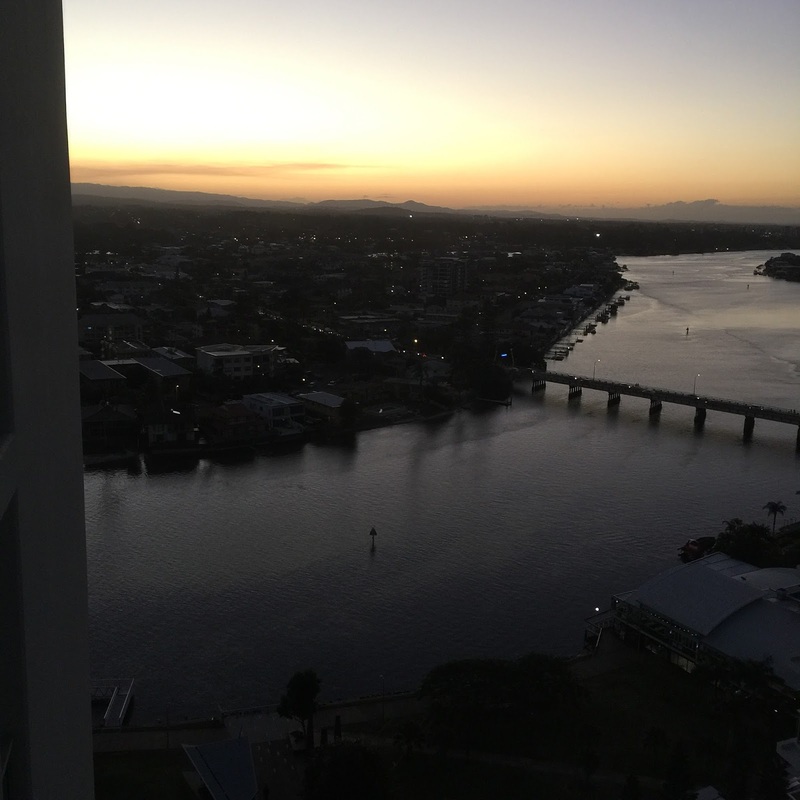 The jets of the jacuzzi of the tub is in tip top condition, provided me with a good massage after a day’s exploring around Gold Coast. The shower area is also located in this wet area, with the regular shower head. 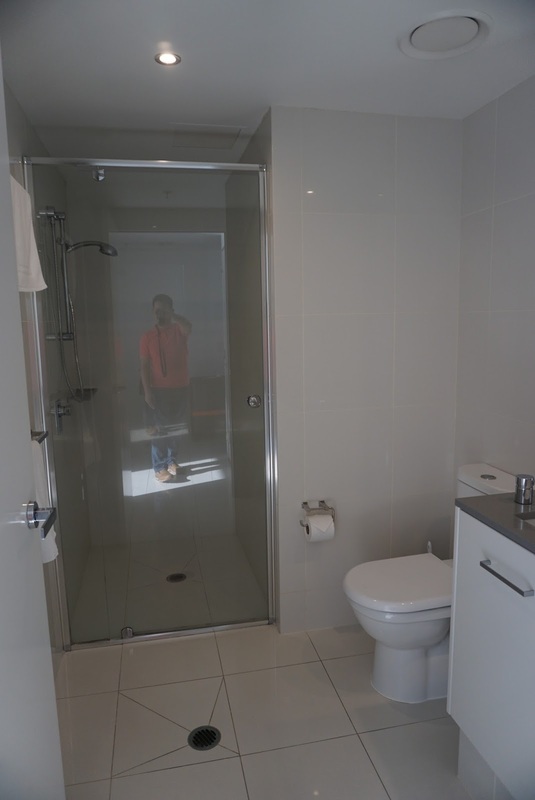 A second smaller bathroom is located outside the second bedroom, close to the entrance to the apartment. Entering this bathroom, the single sink counter top is located on the right of the entrance. As with the other bathroom, the toilet bowl is located after the sink area. There is a walk in shower area tucked in the furthest end of the bathroom. There are no bathtubs in this bathroom. 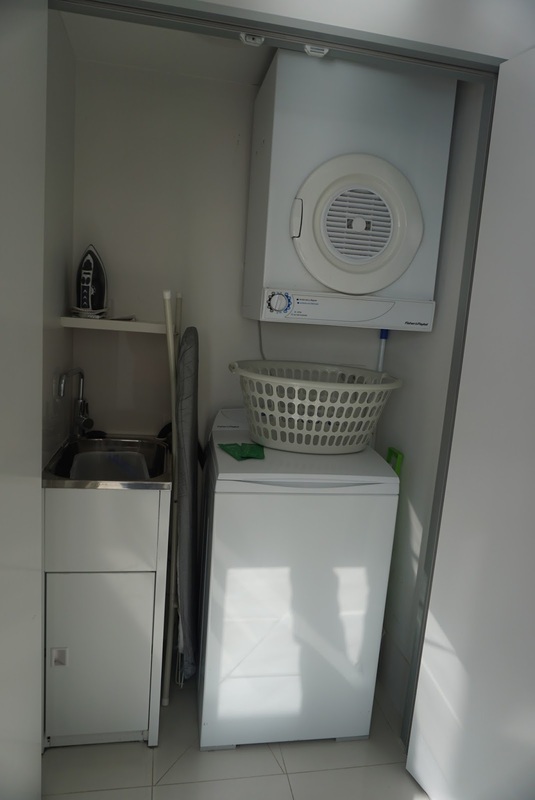 Outside the bathroom, opposite the entrance of the second bedroom, one can find the washing machine and dryer hidden in a closet space. 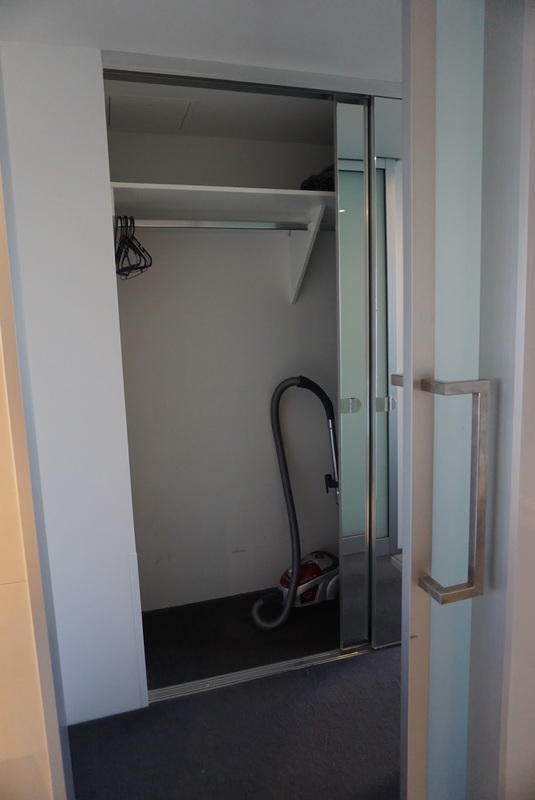 The apartment is managed by a property company that does not comes with daily housekeeping. The only service points that I encountered during my stay were during check in and check out. 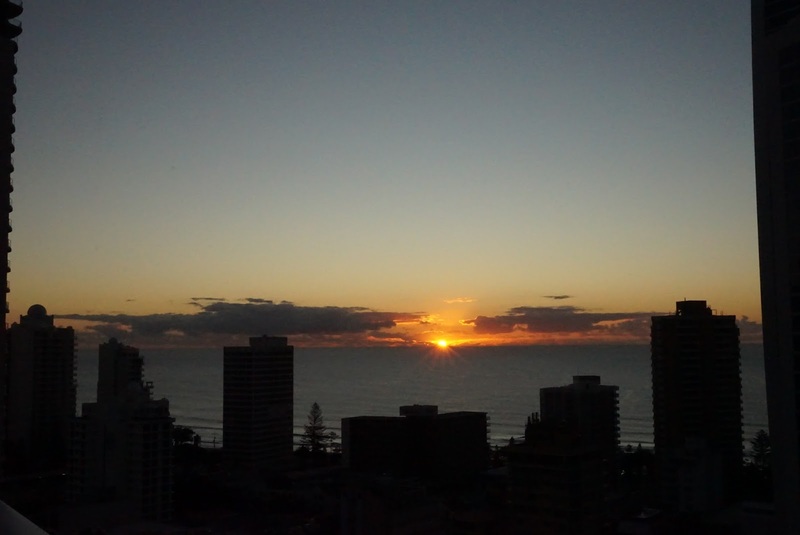 Despite the limited service contact with the staffs of the property company, the service that I received was fabulous. Emma, who processed out checking in and out, was very welcoming and at the same time patient when we needed to call back home to activate another credit card for overseas usage. Emma gave us a detailed brief on what to do should we have any problems with apartment. At check out, Emma was still as welcoming as before and processed our check-out swiftly. 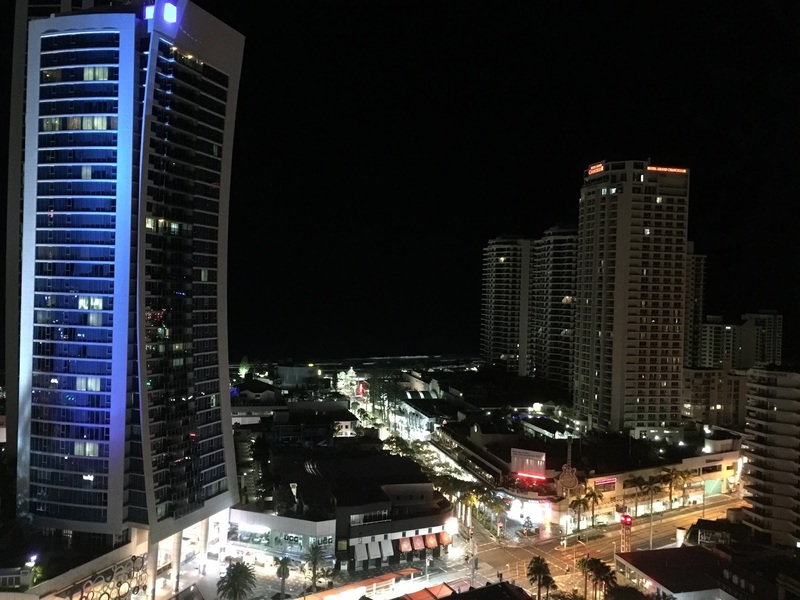 I had a great time staying at Mantra Circle on Cavil during my trip to Gold Coast. 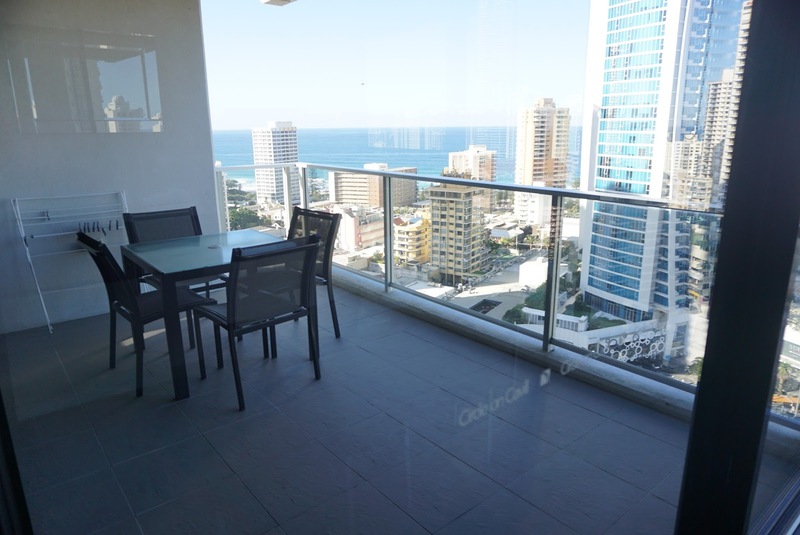 The location of the apartment is superb, very centralised and offered great scenery with both sunrise and sunset visible from the apartment. The apartment has everything that one can find in one’s home and perhaps even more, with beds that provided me with great quality sleep every night. There are no lack of power outlets around the apartment for one to charge their lifestyle gadgets. I would highly recommend one to stay with this property managed by Holiday Holiday.